Four days before his job interview, Dustin Fogel was looking for a new black blazer and a tie. He found them at UC Riverside’s R’Professional Career Closet, known as R’Career Closet. 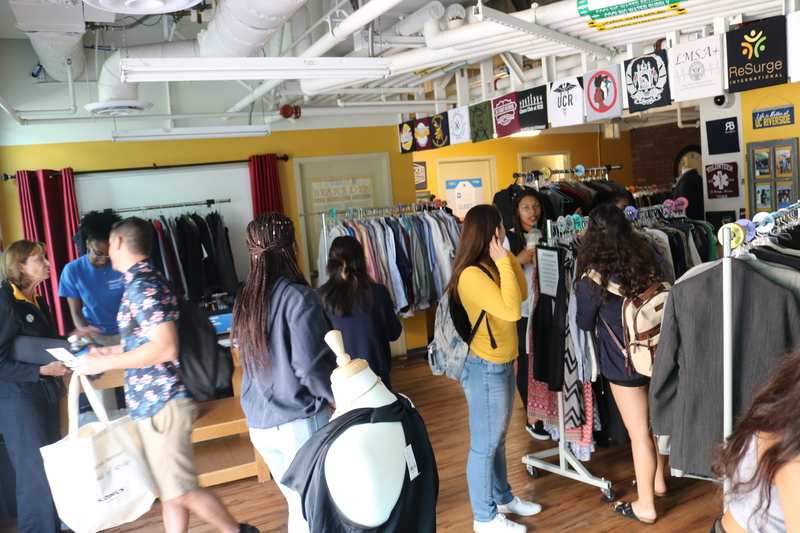 The boutique-like set up, run by the UCR Career Center, offers free, gently used professional clothing to students because the center’s leadership understood that the attire students wear to job interviews is just as important as a strong resume. 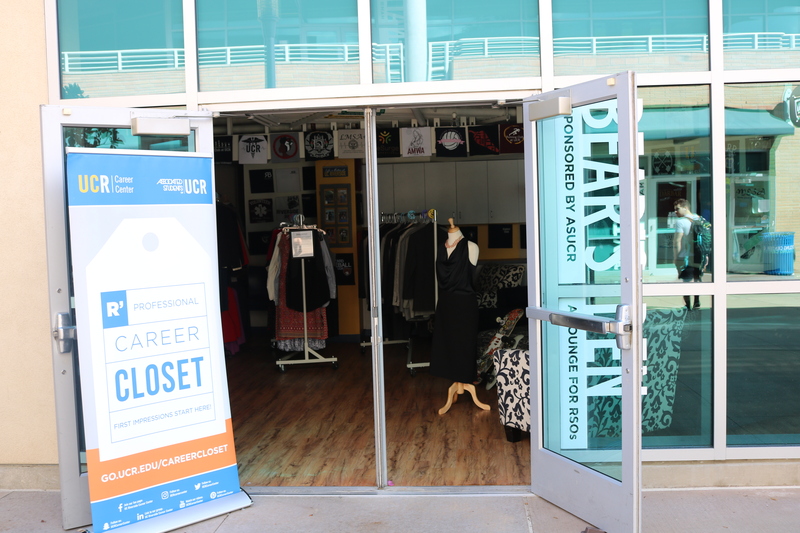 The R’Career Closet, located on the lower level of the Highlander Union Building, is a multipurpose space known as the Bear’s Den. It is only a short walk from the Career Center’s new location. The pop-up space is open Monday through Thursday from 10 a.m. to 1 p.m. 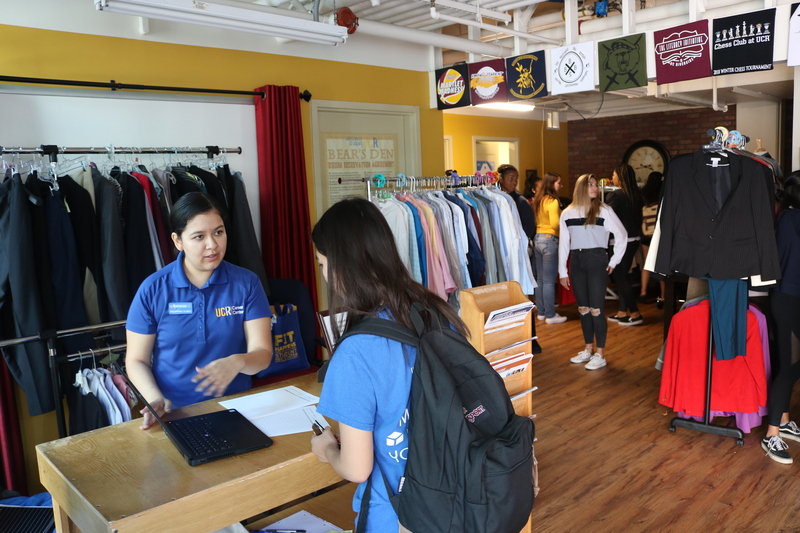 Hundreds of pieces of clothing, including shirts, pants, skirts, dresses, blouses, blazers, ties, scarves, and even shoes and jewelry, fill the Career Center’s bins. Donations are steadily flowing in, primarily from UCR staff, faculty, and alumni. Community partners have held clothing drives and local businesses have also contributed. Students such as Fogel, a 21-year-old plant biology major, are reaping the benefits. All R’Career Closet items are free, and each student is entitled to three pieces per quarter. Between 300-400 items are typically given away each quarter. R’Career Closet is made possible thanks to people like Ebony Phillips, training and development analyst for UCR’s Housing, Dining, and Hospitality Services. Last summer, she walked by the boutique and two student workers explained its mission to her. “I just thought, ‘This is awesome.’ I remember being a college student and closer to graduation having that sense of needing clothing for interviews,” Phillips said. She immediately took action. When Dining was planning its annual summer lunch and team-building day, she asked all employees to consider donating to the closet in exchange of additional raffle tickets. Faculty members are frequent contributors too – one professor donated the suit she used for her first job interview. Meanwhile, an out-of-state job recruiter flew to a job fair at UCR with a suitcase full of men’s suits, all donated by his coworkers. A local dry-cleaning shop owner, whose two children are UCR alumni, has also donated clothing and services. The stories are countless. And the support is appreciated, said Linda LaTendresse, Career Center associate director. Career Center staff spent nine months researching and visiting other campuses with career closets. The original plan was to house R’Career Closet in the Career Center, but as word spread, the team knew they needed a bigger space. Also, since the Career Center relocated from its old location off Aberdeen Drive, it has seen a 37 percent increase in student foot traffic. That translates into greater awareness of services – and the R’Career Closet. The Career Center also facilitates virtual interviews between employers and students, and has the capacity to support 24 simultaneous high-definition video conferencing sessions. Additionally, the center offers laptops and computers for students to work on their resumes or apply for jobs using Handshake, a job search database. The high-vaulted ceiling, glass doors, and 85-inch television screen that greets visitors, immediately sets the mood. That same high-level expectation has been transferred to the R’Career Closet, which sought a partnership with the Associated Students of UCR. 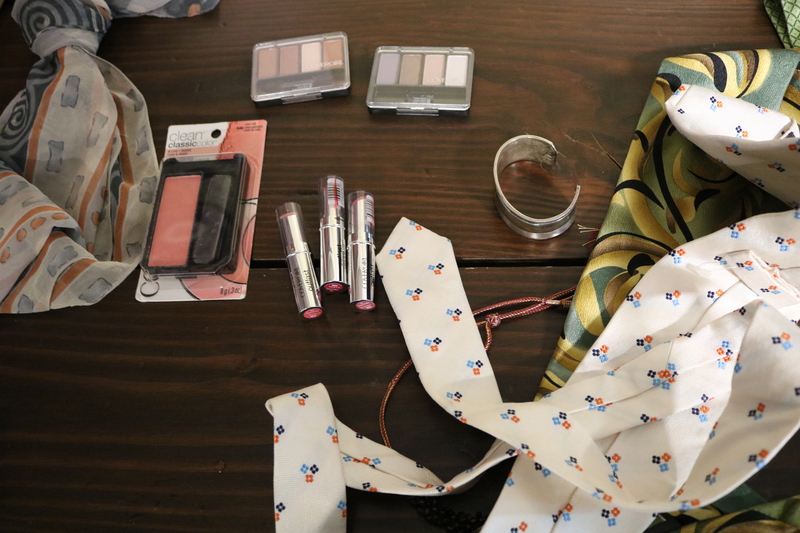 On a recent morning, fourth-year business finance major, Michelle Cook found the pair of slacks she needed to complete her outfit. She was preparing for an interview with a marketing firm in Rancho Cucamonga. A business professor informed her class about R’Closet, she said. First-year mechanical engineering student Sam Hinerman was also perusing the selection. He didn’t have job interviews set yet, but he wanted an outfit just in case one came along. 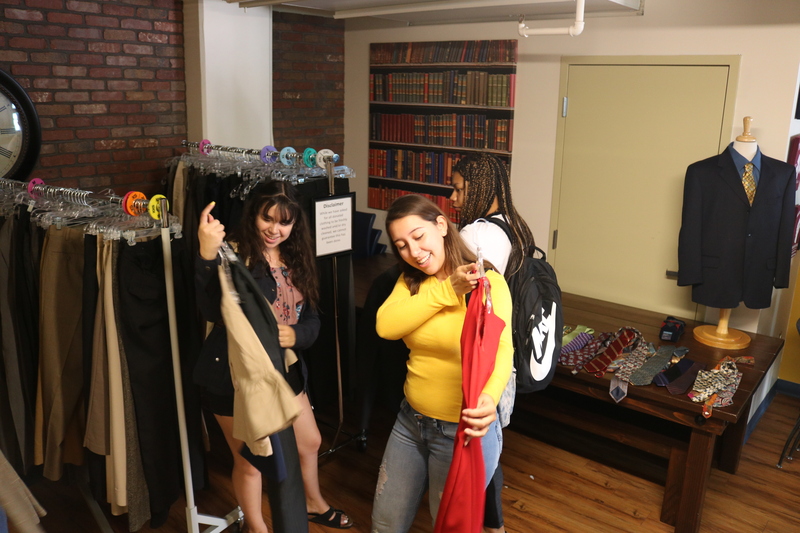 Second-year psychology major Jackie Gonzalez was visiting R’Career Closet for the first time. She had two days to look for professional attire for a campus job interview, she said. Other ways to support UCR's R'Professional Career Closet.